Sorry, This T-Shirt Has Been Sold. For sale here is a rare, vintage late 70s or early 80s ChicagoFest t-shirt. 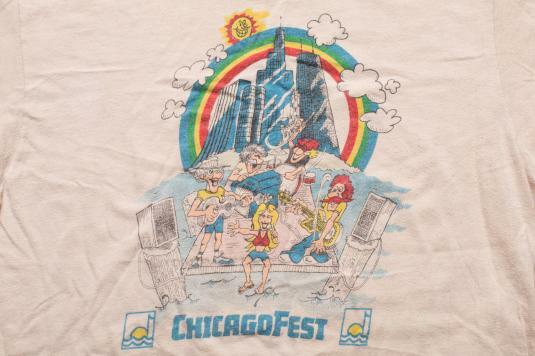 ChicagoFest was a huge, almost two-week-long summer music festival held annually in Chicago from 1978-1983 featuring hundreds of popular bands. This is a soft and thin light tan 100% cotton shirt from Hanes; made in USA. The shirt is in nice vintage condition with no tears or holes. It does have some wear and some light staining. I didn't wash it at all in order to conserve water and energy. The graphics are very nice. Sign-up and save! Get fresh discount codes first! "Vintage" is a term that we don't take lightly. Our shops only feature tees that have been aged no less than 15 years. Our shop keepers are trusted t-shirt aficionados who only offer true vintage garments for sale. No repros or knockoffs are permitted. Should you have an issue with any tee you purchase on Defunkd please contact me directly and I'll make things right!